Are you in Moscow for the first time? You would like to visit the most important sites but also run away from the flooded touristic paths and taste a local lifestyle? If so, than this tour is exactly what you need! Enjoy all the best Moscow has to offer! Take walking tour around major city attractions (Red Square, St Basil’s Cathedral, GUM department store, Lenin’s Mausaleum, Tverskaya street), and then take step back from touristic paths to discover authentic local lifestyle and see Moscow in the eyes of new Russian generation! This tour is fun and interactive. We will spare you the boring stories and focus on the key facts, unfolding the most dramatic and humorous aspects of the Russian history. This tour is also a perfect opportunity for you to interact with locals and learn about the current Russian reality. You get a chance to ask us any questions – how an average Russian life looks like, what do Russians love and hate about their country, what do they think about different social issues and current politics. Discover the major sights of Moscow including Red Square, Kremlin, Lenin’s Mausoleum, St Basil’s Cathedral and GUM department store. Feel the traditional and religious spirit of Russia. Run away from flooded touristic paths and go where locals spend their free time! Visit hidden places of Tverskaya Street. Get the most out of Moscow, while interacting with locals and learning about authentic Russian lifestyle! 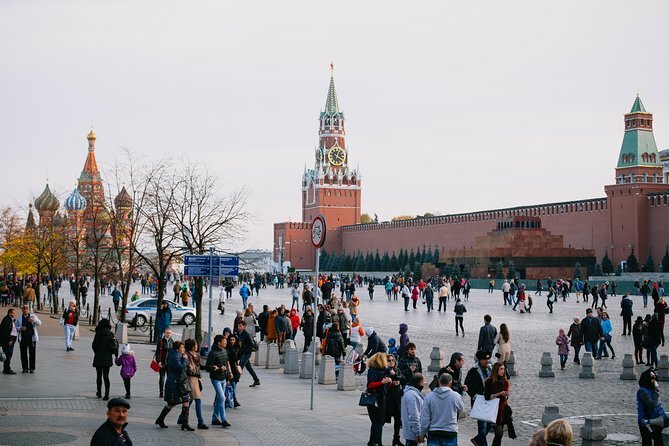 Guided walking tour around Moscow city center, walking by Red Square, Kremlin, Lenin’s Mausoleum, St Basil’s Cathedral, GUM department store, Tverskaya Street and “secret places”. Ilya was an amazing guide. We had him all to ourselves. The weather was not friendly at all. It was cold, gray and snowing and I was carrying a 2 year old toddler all throughout the tour. He was very considerate and we took our time. The snack in a USSR canteen was really nice. We enjoyed the stops to Eliyseev supermarket, mcdonalds, childrens mall and GUM. Thank you Ilya for our unforgettable moscow tour.